When walking around Paris, you can’t miss the numerous matcha tea pastries in town. Here is a small selection of places to enjoy the delicious flavours of this refined tea. What is matcha tea ? This ingredient is prepared from natural green tea leaves which are crushed to obtain a very fine powder. It is used for the traditional Japanese tea ceremony. Matcha is naturally full of amino acids and antioxidants. Three weeks before the harvest, the tea bushes are covered to protect the leaves from contact with the sun. This process provides more green leaves and a powder of an intense green, which also will make it less bitter tea. 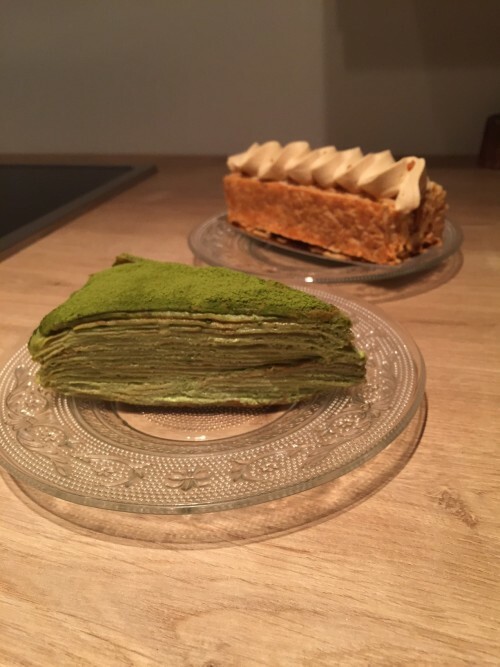 Where to taste pastries at tea matcha in Paris? Sadaharu Aoki, a talented Japanese pastry chef, was trained at the Machida Institute in Japan and worked for several renowned pastry chefs in France, Japan and Switzerland before opening his own boutiques. He now has 4 stores in Paris and 2 stores in Japan for all kinds of foodistas. We decided to go for the matcha tea chou and eclair, as well as the Ginza, equally delicious, with its almond biscuit, hibiscus cream and strawberry, raspberry and blackcurrant coulis. This is a real French-Japanese bakery. At Aki, the staff speaks Japanese and you will find those yummy melon pans to die for, sweet buns which are soft inside and crispy outside, and dorayakis. 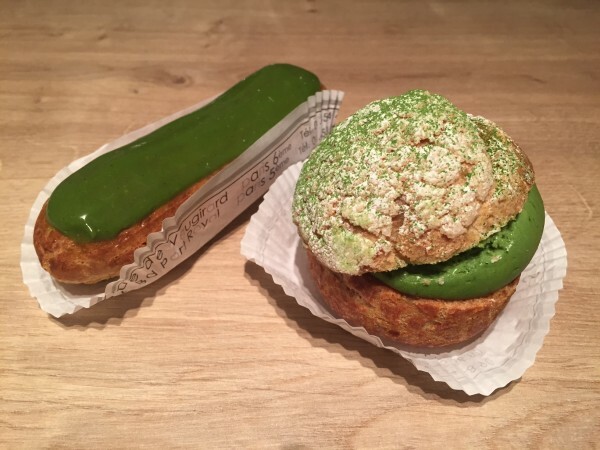 You can also get a nice combination of French and Japanese pastries, with matcha opera or eclairs, for example. It is definitely worth a visit for all matcha lovers. I already knew the delicious Vandermeesch kouglofs on Avenue Daumesnil, leading straight to the Bois de Vincennes, between the Michel Bizot and Porte Doree metro stations. However, I had not ventured yet into the nearby little streets until I heard about this delicious pastry place, which also a tearoom, L’Osmanthe. What particularly caught my attention is that Matcha Mille Crepes, a delicious mix of tasting crepes with the melting flavour of this special tea. The black sesame mousse and praline millefeuille are also worth a visit. This is the latest one opened in Paris. This time, the founders who are passionate about Japan, decided to open a café fully dedicated to matcha and this is pretty well done ! You can go there either for brunch on Sundays, or lunch or even afternoon tea on weekdays or weekends. You will find different types of Japanese meals and matcha-based pastries and drinks. Whether you prefer latte, frappé or matcha cookies, you will find what you like. If you are looking for lactose-free options, their smoothie bowl is almond milk-based. And you can have your matcha latte with soy milk. 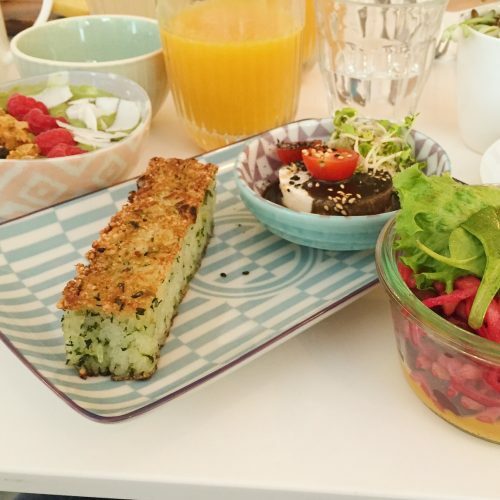 Brunches also include a veggie option without any cow milk or gluten, so really perfect for all tastes ! It is not only a café, there is also a grocery corner where you can find various Japanese products, such as wakame, azuki or sake.